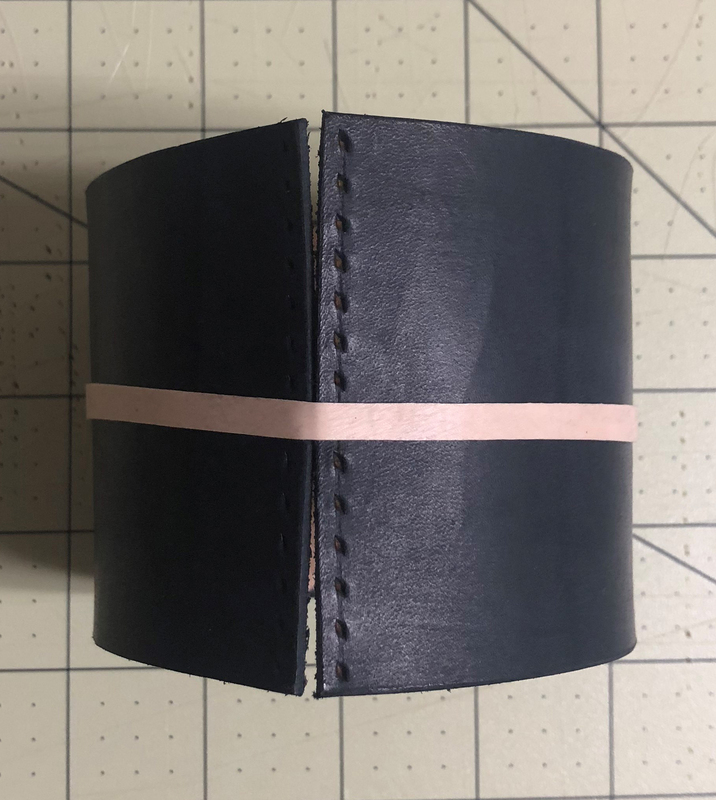 So you’ve been working really hard at developing a new leather wallet for your online shop and you’ve been making sure the design is perfect before you put it up online. You’ve taken some well lit and clear photos and have got a catchy title and description that speaks directly to your ideal customer. But you have a problem. Pricing for profit can be hard for the new leathercraft business owner for a few reasons. Sometimes they make the mistake of putting themselves in their customers’ shoes and then thinking about what they themselves would pay for their new leathergood. Don’t think about what you could afford, but what your ideal customer could afford. Most of the time, you’re not your own ideal customer and can’t necessarily afford your own leather goods. I know I can’t afford mine! Another reason why pricing for profit is hard is that the new leathercrafter for whatever reason doesn’t put a high value on their own product. They just can’t believe that they’d be able to create something of a high value. Obviously, this is not true, and it’s most likely just a mindset issue. And finally, money is weird. Right? For a lot of people, the exchange of money for something that they’ve made can just make them feel uncomfortable. Ever tried to negotiate a salary or ask for a raise? That queasy unsure feeling that can come over you is the uncomfortable feeling that I’m talking about. And to avoid this discomfort, people often times undercharge for their products and as a result never stay in business for that long. So the reason why we must price our products for profit is because if you’re not profiting from each sale that you make, then you’re breaking even or worse losing money on each sale. If you’re losing money or just breaking even, then you don’t have a sustainable business. You have a hobby that you are self-funding. Without a profit, not only are you not able to sustain your business and continue it but you’re also not able to scale and grow your business into something bigger. So to avoid going out of business before you even get started, use real numbers and two simple pricing formulas to get your base price. So for example, let’s say you have made a wallet that you want to put up for sale on your website. Your materials costs are $9 and say your hourly rate is $20/hr and it took you 30 mins to make. Your wholesale price for the wallet is going to be $38 and your retail price is going to be $76. Now before you think “oh no, that can’t possibly be the price and this formula doesn’t work for me!”, just know that this price is not carved in stone. Many people think that they have to use the exact price that the formula gives them but this isn’t true and I’ll tell you why in a minute. The biggest pro to using these formulas is so that you know that your base costs are covered. So instead of thinking, “what would my customer pay for this or what would I pay for this?” and pulling a number out of thin air, you can be sure that your costs are covered and that you’re making a profit on each sale. After you’ve run your numbers through the formulas, you can now analyze and use this price as your jumping off point. Ideally, you know who your customer is and you know what kind of pricing strategy that your business operating under, right? For example, if you’re targeting a higher end luxury customer, you’re probably going to price higher then what the formula gives you. Instead of a 2X markup, you might have a 4X markup (the markup is the factor of 2 that you are multiplying your costs by). Keep in mind, that if you’re trying to reach the high-end customer you must be operating a high-end business across the board. This means having a high-end product, high-end customer service, high-end website, and branding etc. If you’re targeting a mid-range customer, who expect quality but at a competitive and reasonable price you’re probably not going to veer too far from the price that your formula has given you. So when it comes to pricing your leather goods, make sure you’re looking at the big picture. Think about who your audience is, what type of customer you’re targeting and that you’re using real numbers and these simple pricing formulas as a jumping off point. 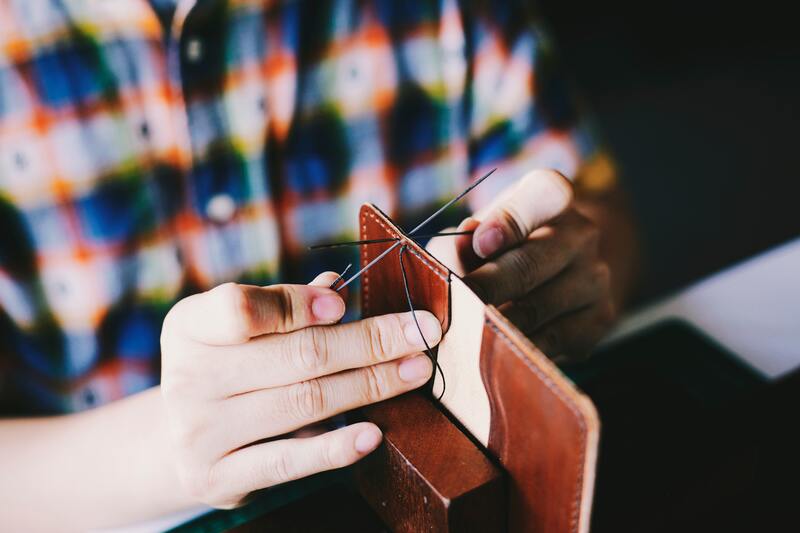 In addition to profitable pricing, there are 3 strategies that every leathercrafter should be implementing into their business when they first get started. I’ve created a detailed guide that shows you exactly what these 3 strategies are and how to implement them into your business so you can not just sell your leather goods, but create a successful leather goods business that you can grow. Download your copy at www.lucrativeleathercraft.com. Mary Savel teaches people how to make and sell their traditional leatherwork online, at craft fairs and to stores. She runs www.LeatherBeast.com, www.MarySavel.com, and lives and works out of her NYC apt that she shares with 1 boyfriend and 2 cats. 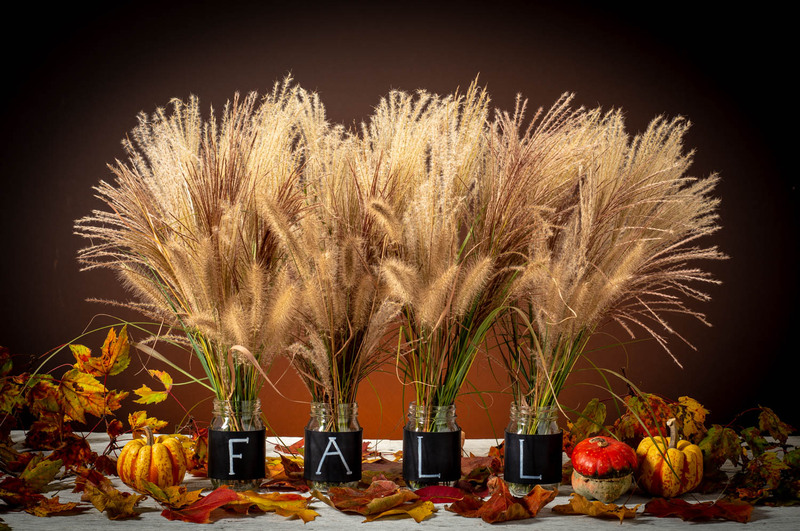 If you’re looking for an easy DIY fall decoration or table centerpiece, check out the step-by-step instructions below! I used a natural veg tanned leather in 2/3 oz. and dyed it black, but you can use pre-dyed leather in veg tanned or chrome tanned. You really can’t go wrong with the leather you choose. I just would not recommend using anything over 5/6 oz. in weight. 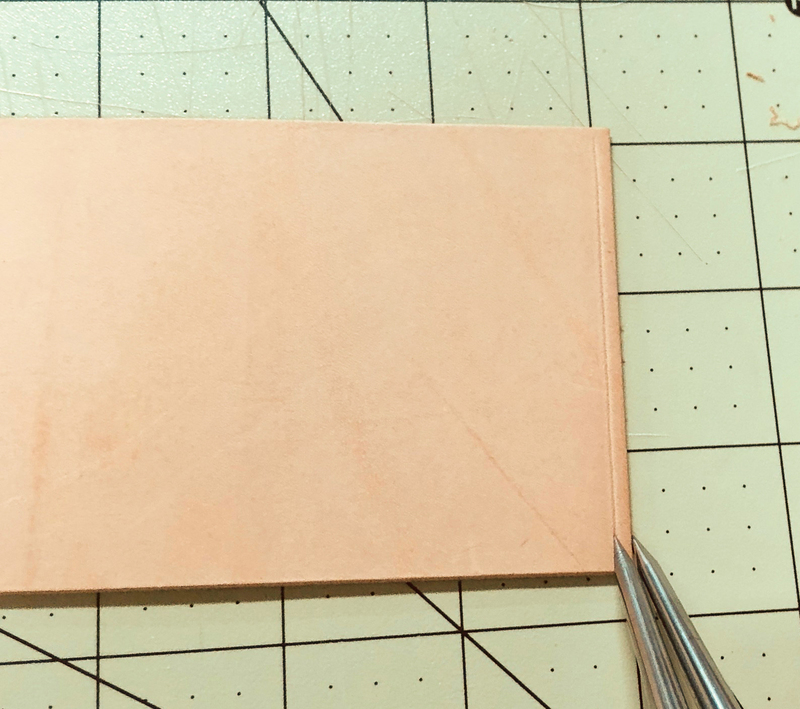 Cut your leather pieces into roughly 10-1/4” x 2-3/4” rectangles. I needed four pieces for this project. Use your wing divider and make a stitch line down the short sides of each leather piece. I set my width at approx. 3/16”. 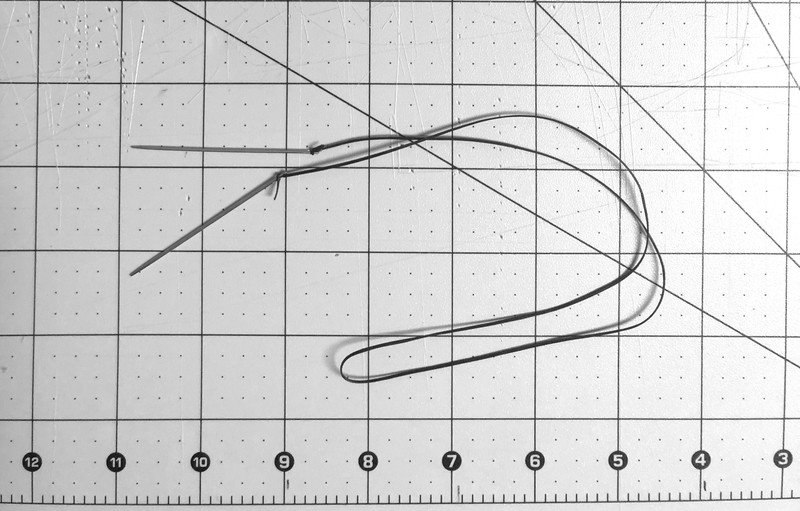 Use your stitching chisels and punch your stitch holes using the stitch line you just created as a guide. Make sure you have the same amount of stitches on each side. For a more professional look, I would recommend dip dyeing the leather so the back is dyed also. I did not have a container close by so I used a wool dauber and Fiebing’s Pro-Dye in Black. To minimize spills, lay out a plastic bag or a piece of plastic and layer it with either a paper bag or a sheet of packing paper. I put about three generous coats of dye on each piece of leather for maximum coverage. I wanted black and white as my colors so I used the Angelus® Paint Marker Set in 3 mm and according to the directions that came with the markers, I put equal parts Angelus® Acrylic Leather Paint in White and Angelus® 2-Thin into an empty paint marker and shook it to mix well. I then wrote out the letters I wanted onto my dried leather pieces. I went with FALL for mine. It took several coats of white since we thinned it down for the marker but it dries pretty quickly so by the time I was done with the last letter I could go back over the first one. 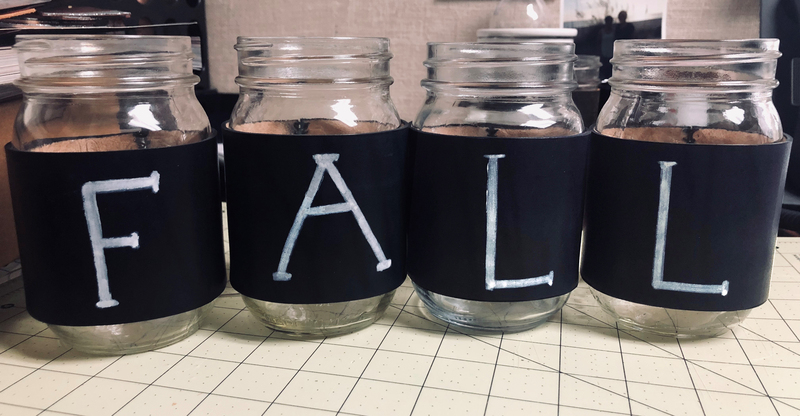 You can do any letters you want in the color of your choice — there are so many options for this! 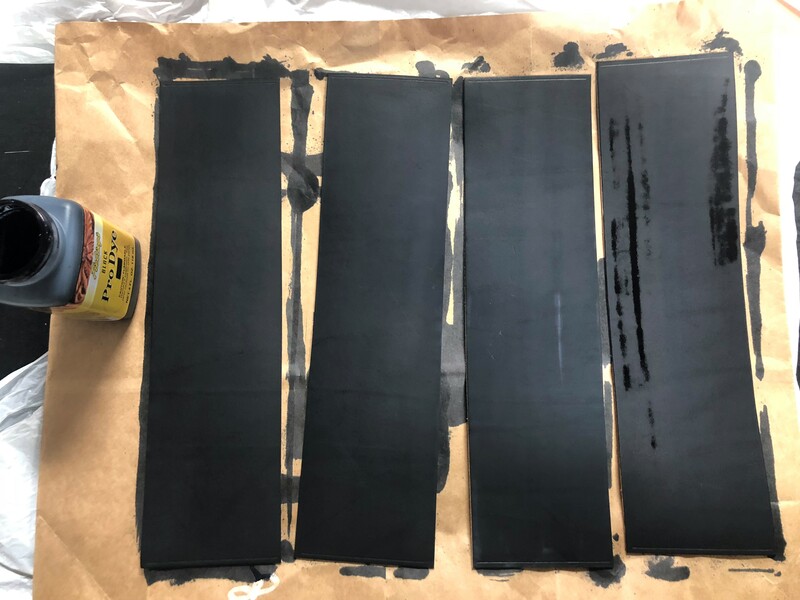 Apply your favorite leather top coat, making sure the paint is completely dry for this step so the black and white colors don’t start running together. Angelus® Matte Acrylic Finisher, 4 oz. Angelus® Satin Acrylic Finisher, 4 oz. 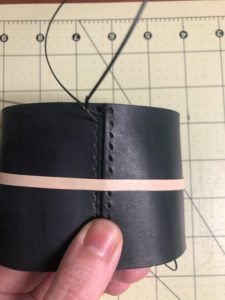 The easiest way for me to stitch this was to wrap a rubber band around the leather to keep it in a circular form and stitch it while it was not on the jar. I used a baseball stitch for this project. For in-depth instructions for this stitch and many more, I would highly recommend this book. It has step-by-step instructions for leather techniques, stitching, and projects. It is a great book! Cut your thread approx. eight times the length of the span you will be stitching. I used 16”. Take your cut piece of thread and attach a needle to either end so you will have one piece of thread with a needle at each end. Pull the threaded needles from front to back on the first set of stitching holes making sure to have equal length thread on each side. 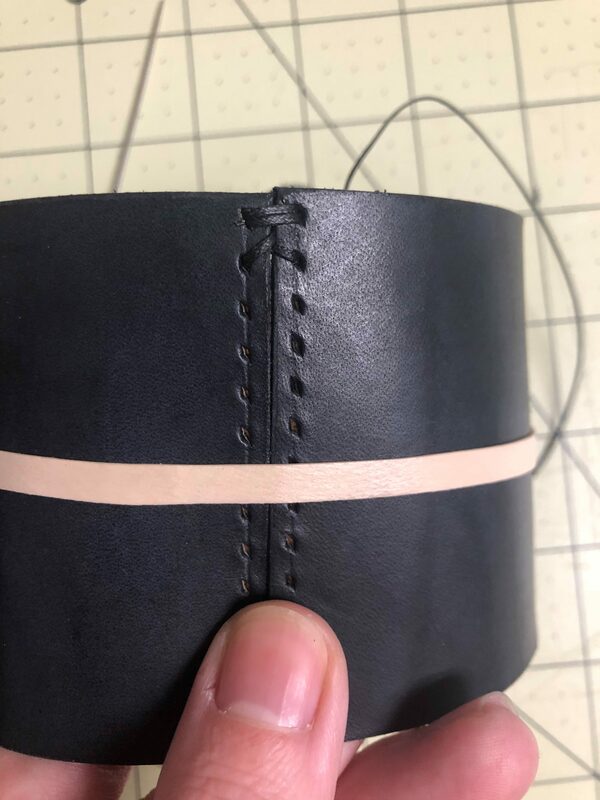 Then, take one needle and loop it around to the other side, pull it through to the front and continue looping it back around and down the original hole, this will give you a double loop and anchor your stitching. 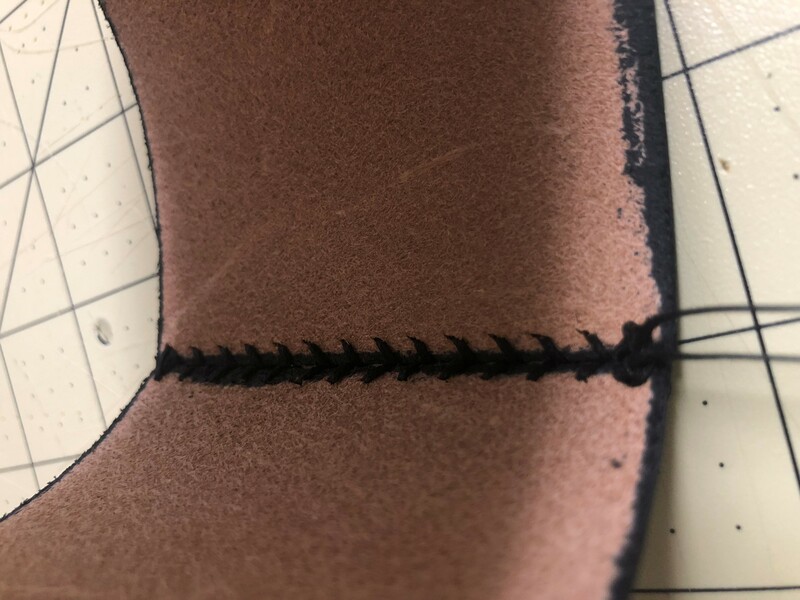 Pull one of the needles up through the center seam of your leather from back to front and go through the next stitch hole on the opposite side from front to back. 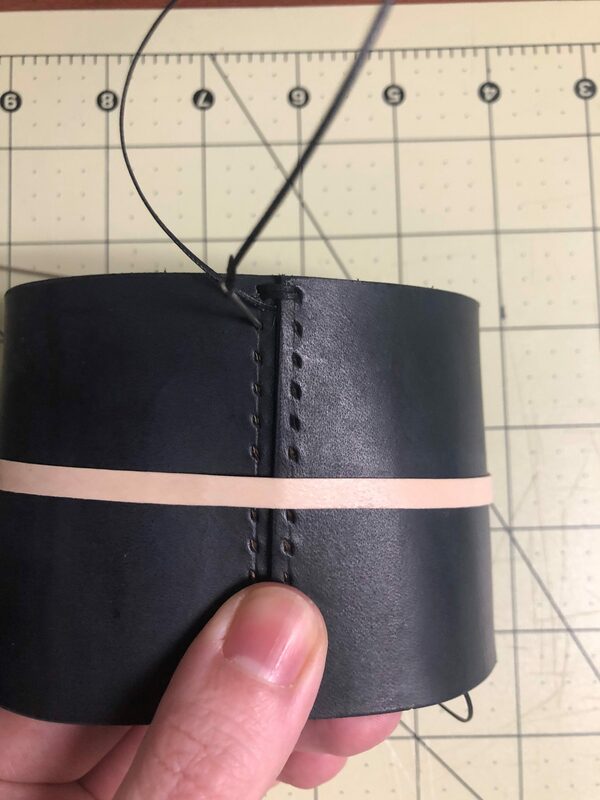 Repeat with the opposite side of the leather to create your first row: pull the other needle up through the center seam from back to front and through the next stitch hole on the opposite side from front to back. Continue this pattern all the down to the last stitch hole. Once you’re at the end, take each needle, loop it around to the other side pulling them from back to front, and then continue looping them around from front to back. Both needles should now be on the backside of the leather. This will anchor your ends in place. If your stitches are loose, you go back through and tighten them using an awl. Once your stitches are tight, tie a double knot and trim off your thread. Repeat the stitching for all four sleeves. 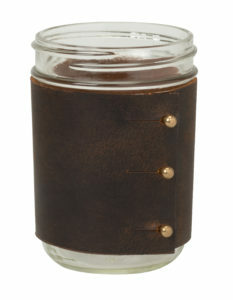 Once your stitching is finished, slide the leather sleeves onto your pint jars and you are all done! 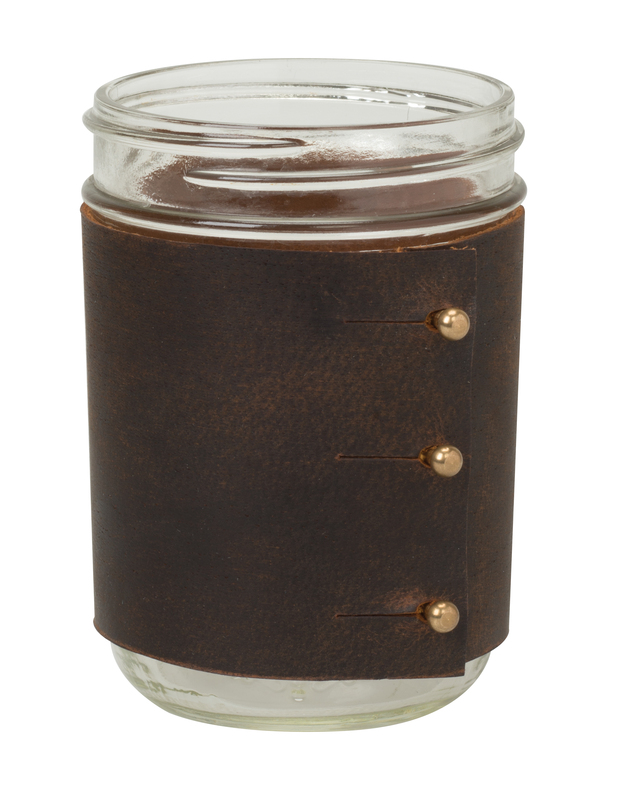 This project was inspired by the Mason Jar Sleeve tutorial found in this Leather Crafts Book. 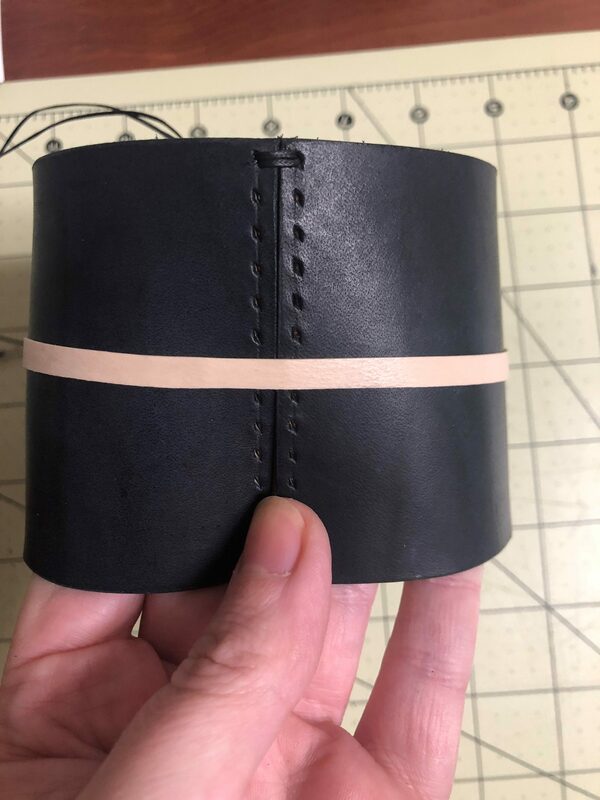 If you are looking for a leather wrap pattern that can be used as a beverage sleeve on a wide mouth jar this is a great tutorial! There are so many neat projects in this book along with stitching instructions and tool how-to’s. The one pictured below is made according to the pattern in the book, but instead of stitching it I wanted to add button studs. Just add ½” length to either side when you are cutting the pattern and attach three button studs! Super cute with a latte in it! What are some basic knots I can incorporate into my leatherwork? 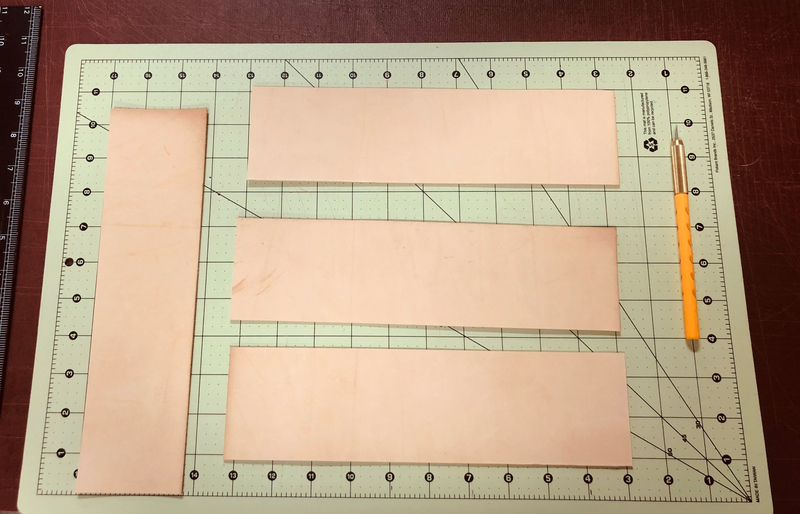 What leather weights should I use when molding and forming? We have 900,000 square feet of leather, on average, in stock. That’s enough to cover 20.6 acres. To put it in perspective, the home of the Statue of Liberty, Liberty Island, could be covered almost twice with all that leather. We know first-hand the role the quality of your leather can play in the success of your project. That’s why our team is dedicated to bringing you quality leather from the best tanneries in the world including renowned veg tanners like Hermann Oak® Leather Co. and Chahin Tannery. We have cultivated close relationships with our tanneries to offer you high-performing leather at a great value. WHY BUY FROM WEAVER LEATHER? Our tanneries stand behind their products like we do. This gives you peace of mind and security in knowing you are taken care of if there ever is an issue. We grade it right and sell a true tannery run grade. The leather shipments we receive from our tanneries generally consist of 25% A grade, 50% B grade and 25% C grade. This is known as a standard TR or tannery run selection. As a manufacturer, we use many of the lower grade hides in-house because low grade does not mean low quality. They have the same quality as higher grades, but because of surface defects need more attention to cutting to obtain an acceptable yield. With our large variety of manufactured products and cutting expertise, we are able to utilize these hides effectively in our own shop. We inventory the leather on our website and ship most orders within 24 hours. 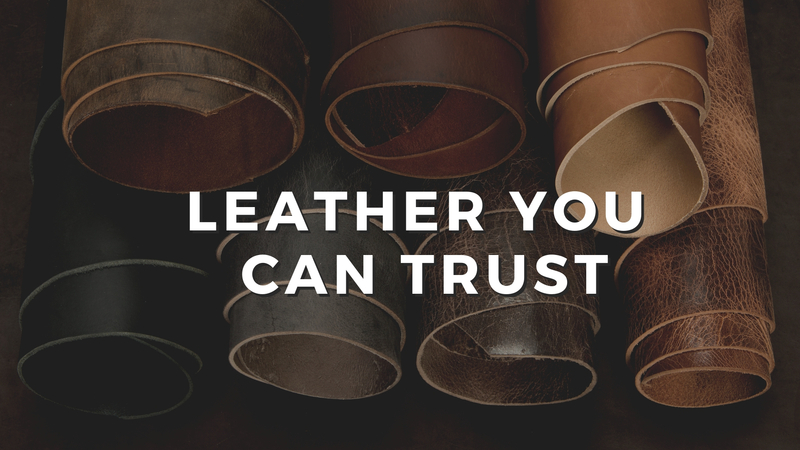 You can count on us to deliver the leather you need when you need it. Over 80 years of combined knowledge from our experts. From working with tanneries to leather cutting, manufacturing, picking, and shipping leather to our customers, we have experts in every area so you can be assured we can answer your questions. 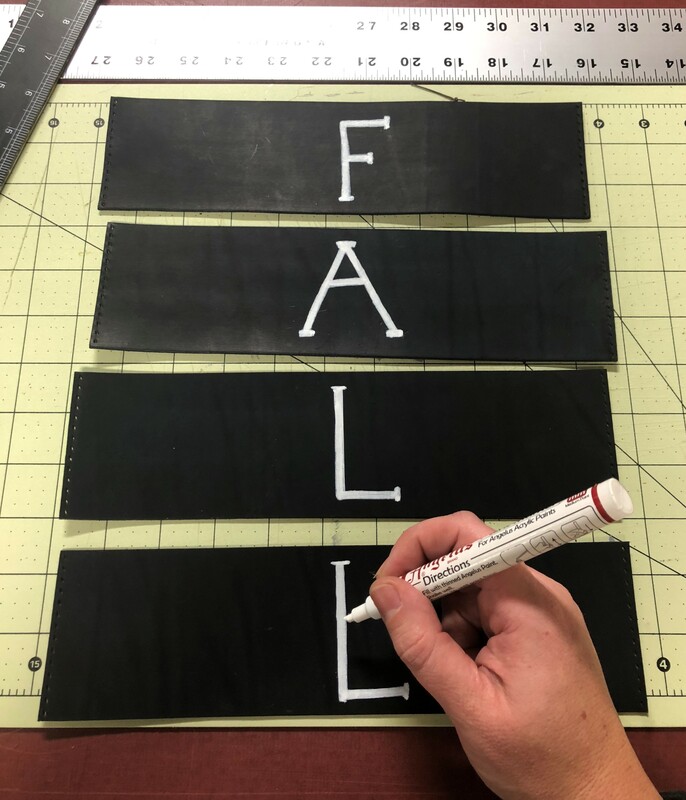 The entire Weaver Leather team is committed to exceeding your expectations and bringing you the best leather for all your projects.